Simple - it was especially designed small for baby toddlers. Perfect for Babies and young toddlers. Small moonwalk can also fit into small back yards or even indoors. An inflatable moonwalk with a ball pit for plenty of bouncing activity and motor skill fun. A horizontal log separates the ball pit from the large jumping area, so players can choose whichever activity they want. 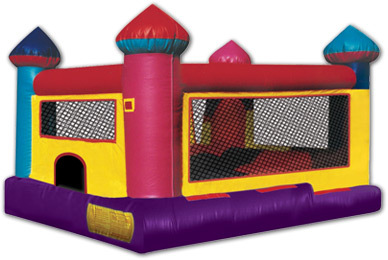 A bright color scheme is enhanced by four tall towers in each corner, making this bounce house an inviting draw for all guests at your event. The Mini Jump and Ball Pond combo bounce house is the ideal way to promote social skills, confidence, play and exploration for children. This unit is the perfect way to combine fun and healthy activity. With a variety of colors, shapes and themes, this unique moonwalk offers toddlers exciting aerobic activity. Suitable for toddlers aged 2-4 only. "Customer Service was great. " "Delivery/set-up/pick up time was great." "We were very happy with the water slide and you order and confirmation process we will be using you again in Sept for our next block party!"